As obvious as it sounds, it’s not necessarily about the dirt you can see on the windows. The front windscreen in particular can of course get dirty on the outside, but can often get a thin hazy film on the inside. This can be due to smoking, car heaters pushing recycled air or dirty air onto the windscreen and also something called outgassing which is plastic-vinyls releasing plasticisers. Plasticisers provide vinyl plastics with flexibility and durability but are released into the air, particularly on warmer days and can cover the inside windscreen (and other windows) in a waxy thin covering. This thin dirt and waxy film is hardly noticeable during daylight, but reduces visibility when driving at night. Most noticeable is by the increased glare from other vehicles headlights at night. This film can be easily removed by a water and vinegar solution. The car interior mirror is subject to the same waxy film as the widows interior surface and should be cleaned in a similar fashion to aid in reducing glare. Try also to avoid touching the glass of the interior mirror as the grease left behind off your fingertips will increase headlight glare whilst driving at night. ensure all mirrors are clean and grease-free and are set up correctly. Correct car mirror adjustment is essential for observational safety, but can aid in reducing headlight glare at night. Cleaning your vehicles headlight will help to reduce glare for other drivers. The thin coating of dirt and oil that builds up on headlights distorts the light and cause glare for oncoming vehicles. Cleaning your headlights will of course benefit you as it will increase both short and long visibility when driving at night. Having your eyes checked at the optician is something that many of us neglect for long periods. Other than the usual deterioration in eyesight over time, other issues may be found that effect vision and glare whilst driving at night. Glaucoma and cataracts are known conditions that cause problems whilst driving at night. Most significant on unlit roads, night driving glare from oncoming headlight can be potentially hazardous and cause panic. Overt your eyes from the glare and look to the left of the road following the road side or line so as to keep track of your position. If the glare is particularly bad, slow down or stop your car. Ensure however that there is not another vehicle following closely behind you before stopping abruptly as this is likely to be more hazardous than the glare in front of you. The internal rear view mirror will have a flip switch which is ideal to eliminate glare from the rear in your mirror. Between sunset and sunrise, by law you must ensure all headlights, sidelights and rear registration plate lights are lit. You must also ensure all lights are in good working order. Police often stop motorists with defective lights although this will usually result in a warning or you may be issued with a Vehicle Defect Rectification form in which the defects must be rectified within 14 days and the form stamped by an MOT station. Failure to amend defects will result in prosecution and penalty points on your licence. In extreme cases, police may issue you with a Vehicle Defect Rectification Notice, along with a Fixed Penalty Notice. Once you are no less than level with the vehicle you are overtaking, you may switch to full beam headlights. Avoid doing so earlier as you may dazzle the driver of the vehicle you are overtaking in their mirrors. If you are being overtaken, dip your main beam headlights just as they are level with you. Always use dipped headlights in built-up areas as it also helps others to see you. Urban built-up areas offer street lighting – some areas better than others. Some councils have opted to turn off street lighting altogether late at night in some areas. Areas where there is little or no street lighting can be hazardous for pedestrians and cyclists. Where you may see a pedestrian approaching a pedestrian crossing during the day and anticipate slowing or stopping, driving at night can be more difficult. Be prepared to stop at pedestrian crossings and only travel at a speed in which you can safely do so. Country road driving requires a good control of speed and anticipation and planning, especially at night. Always travel at a speed in which you can safely stop if something unpredictable happens. Always anticipate a potential hazard, especially on bends and in wet weather. Motorways and dual carriageways represent the safest of roads in the UK due to them being wide and relatively straight. Night driving in particular however can lead to problems on motorways due to the monotonous nature of road type and causing tiredness or even falling asleep. Due to the high speed of motorway driving, accidents are often serious or fatal. If making a long motorway journey, ensure you are well rested beforehand and if tired during the journey leave at the next available exit and find a safe place to rest. There is a benefit of driving at night and this is meeting other vehicles. This occurs on narrow residential streets where there is a need for passing parked cars on the opposite side of the road. During the day it can often be impossible to tell if there is an approaching vehicle when passing parked cars if there is a bend in the road. Driving at night will allow you to see the oncoming vehicles lights well in advance, providing you with plenty of warning. Although the disadvantages of driving on country roads at night outweigh the advantages, the ability to see an approaching vehicles lights around a bend is beneficial. Other vehicles headlights provide you with information on the direction they are traveling and their speed. One of the most frequent complaints regarding driving at night is the glare emitted from oncoming vehicles headlights. Driving at night glare from headlights can be reduced by following the simple tips below, there are also night driving glasses available that claim to reduce glare. There tends to be mixed opinions on whether night driving glasses work at all and to how much extent. Night driving glasses can either be totally clear but have a anti-reflective coating applied, or have a yellow tint to them. Night driving glasses with a yellow tint tend to have a more positive response by their wearers in terms of blocking the amount of glare and dazzle by vehicles headlights. Are night driving glasses legal? Night driving glasses are not illegal, although opticians and the Driver and Vehicle Standards Agency (DVSA) do not recommend driving at night with tinted glasses of any kind. Although they are likely to reduce the glare from headlights, they will also reduce your overall visibility to some extent. Although they use different technology, yellow tinted night driving glasses, authorities deem such glasses similar to driving at night with a tinted front windscreen – which is illegal. If glare from other vehicles headlights causes too much discomfort and stress at night, consult your optician for appropriate night driving glasses and follow the simple tips below. Whilst waiting in traffic at night. apply the hand brake / parking brake and release your foot from the brake pedal. Brake light dazzle or glare can cause eye discomfort to those behind. However, the opposite applies in fog. You should always switch from main beam headlights to dipped headlights as soon as you see another vehicle front or rear, a cyclists or pedestrian. 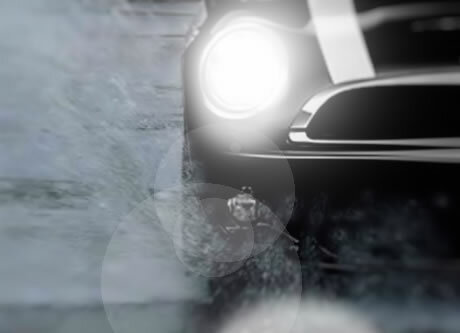 Dipped headlights allow a viewable distance of around 30 metres, main beam headlights allow a viewable distance of around 100 metres and so are much more powerful. Even dipped headlights can dazzle another vehicle, so it’s essential that you switch from main beam to dipped headlights just before you see another vehicle directly as the dazzle can literally blind the driver of the oncoming vehicle. Learner drivers often don’t get the chance to learn to drive at night. This can often be due to the long days of the summer months making it impractical. New drivers statistically represent the most at risk of an accident and as driving at night differs drastically from driving during the day, it is important to get yourself prepared. If learning to drive outside of the long summer days, ask your driving instructor for one or two driving lessons at night simply to gain experience. Even if you have passed the driving test and have not driven in the dark, there is no reason why you shouldn’t ask a driving instructor to take you for a lesson when it’s dark for night driving experience. Driving instructors don’t just teach learner drivers, they provide lessons to all ages and to the inexperienced to the experienced. If you are unable to use a driving instructor, before you venture out for your first time night drive on your own, take an experienced passenger with you to help provide you with confidence and tips. There are also courses available to those that have passed the driving test. Pass Plus is one example, being relatively short at only 6 hours, the Pass Plus course involves night time driving as one of its core modules. Is it ok to use side lights during the day when visibility is only very lightly reduced to help be seen rather than headlights? Since 2011, all new vehicles have daytime running lights which are much brighter than side lights. This is to increase the visibility of your vehicle to other road users and pedestrians. It may prove a little safer if you use side lights at all times during the day and if visibility is reduced then switch to head lights.